I’ve been grossly ill for the entire week. It’s not like a flu or strep throat thing though. When I wake up in the morning, I just feel like I was hooked up to “The Machine” from The Princess Bride for 10 hours. 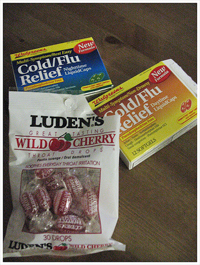 While I was in the store looking to buy some relief from my burning throat I saw a big bag of Luden’s cherry throat drops. I don’t think I’ve actually had these since I was 7, but I remember them vividly as being very tasty and ineffective. How did they dream up marketing Jolly Ranchers as throat drops? Genius! Also, I was watching the news yesterday when I heard about Google’s latest revelation: The Google Flutrends. I now spend an obscene amount of time following the flu trends of the nation and when I meet someone from an area with moderate to high flu levels, I immediately judge them. Have a solid weekend and try to stop by Macheesmo tomorrow – I’m making crepes! I’m sorry. I mean crêpes! I remember Luden's! Didn't do any good, but tasted good to my little-girl taste buds. Have you tried Zicam to make the cold less severe? As for chicken soup, I've become a total fan of The Splendid Table's Garlic Soup — chicken stock, obscene amounts of garlic, and I think some egg. Couldn't find it on the web, but if you have the book, look there. Terrific. I haven't tried Zicam. Maybe I will though if this plague keeps up. Thanks for the recipe tip also. Cheers! Hope the crepes help you feel better! Will be back to check them out! broken links: neither the youtube potato link, nor the zeer link work at this time. I realize that it’s an old page and you may not wish to change it (or care very much), but I thought I’d mention it.